Grace Fuller, the youth pastor in her father’s church, is guarding several painful secrets that threaten her future. Will she find a happily-ever-after with Steve, the confident, handsome assistant pastor with whom she’s vying for her dream job, or will the mysterious bad-boy biker who has just come to town, darkly guarding his own painful past, steal her from her chosen path? Fair of Face is the third book in the eight-book series The Extraordinary Days by breakthrough novelist Polly Becks. The first book, set in 1991, No Ordinary Day, tells the tale of an epic tragedy that changes life forever in a small town in the wild, mystic Adirondack Mountains of upstate New York, especially for eight special women, and the mystery surrounding that tragedy. 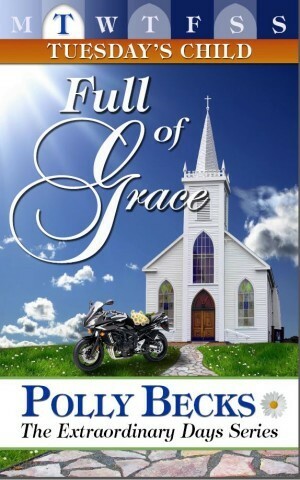 Buy TUESDAY’S CHILD: Full of Grace now! Each book in the Extraordinary Days series makes a direct cash donation to a different charity or non-profit organization. Your purchase of Tuesday’s Child: Full of Grace benefits Tuesday’s Children, a non-profit organization founded to promote long-term healing in all those directly impacted by the events of September 11, 2001.